There are three comprehensively fitted variations. Each one comes with six air-bags, ISOFIX child seat mounting points, anti-lock Brakes (ABS), Electric Brake-force Distribution (EBD), Electronic Stability Control (ESC), Brake Assist and Traction Control - as standard. Venga 2 models add 16-inch alloys, and steering-wheel mounted controls. Range-topping Venga 3 adds a panoramic electric sunroof, privacy glass and climate control. KIA Motors has taken a huge leap forwards in terms of quality since its, let's face it, quite bland offerings of ten years ago. It's now firmly established itself in a number of segments with a selection of nice looking, well built and, dare I say it, desirable cars. And is consistently growing its share in each arena. Okay, so KIA already has two cars in this burgeoning sector for small family holdalls, so why would it want to make another? It's simply created a car that's different from its others - meeting the needs of busy young families. I think KIA has seen other models in the market place and has set out to improve on those, giving drivers even more choice. 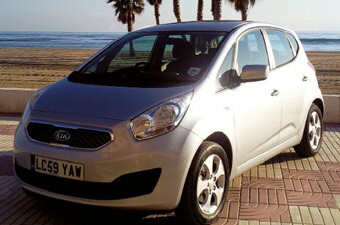 My first impression of the Venga is how similar it is to the new Ford Ka. It's just a bit bigger and has four doors. It has a quirky face with a cheeky grin and large doey eyes. Whichever way you look at it, it's certainly got plenty of curb appeal. A compact exterior and cute wheel-in-each-corner stance belies the spaciousness within. It is like approaching a small car and finding yourself climbing inside a large MPV - with five full-size seats and plenty of room to spare. Inside, the seats are really comfortable and the switchgear around the ultra-modern dashboard and steering wheel are all within easy reach. Knobs and switches feel so much more substantial than on previous KIAs. A high driving position is easily obtained thanks to the height-adjustable driver's seat. Frankly you wouldn't expect anything less in a new car these days. Sitting higher off the road is always more enjoyable, I think, than dragging your backside along the floor. Perhaps it's just me, but I do like to see over the bonnet and beyond the car in front. One of the most pleasant surprises in the cabin is how light it is - daylight just floods in. The big windows afford great visibility and add to the illusion of this being a much bigger car. I fired up the test car, with its 1.4-litre petrol engine (all three engines in the Venga range are EU5 emissions compliant), and straight away the superb soundproofing inside the cabin was doing its job. Even at speed, road and wind noise was kept at bay. Despite the meagre 89 horsepower, the engine had a good amount of pull and was well suited to the five-speed manual gearbox. I thought this was one of the best features and my driving partner also commented on the quality of the sporty short-shift box. The rev range was perfect and there was no vibration - just smooth changes up and down. We put the car through its paces with a mixture of town driving, twisty rural roads and mile-upon-mile of motorway, with lots of roundabouts thrown in for good measure. After several hours of driving, the car was still comfortable, quiet and smooth, and it behaved more like a bigger commuter model. I was very impressed with the ride quality. Economy on our journey was fairly impressive too, realising about 42mpg overall. If there was one criticism, then it would be the price. Despite being well made and well specified, the kick-off price of £11,495 puts it on a level with the likes of the VW Polo and Ford Fiesta. However, judging by the high quality fit and finish and the unmatched seven-year warranty, KIA has fought and rightly won its place alongside the stalwart car-makers. Perhaps that's why 30 per cent more people chose to drive a KIA last year than in 2008.